The Cuisinart Automatic Cold Brew Coffeemaker is a 7-cup coffeemaker that makes ready-to-drink coffee in as little as 25 minutes. 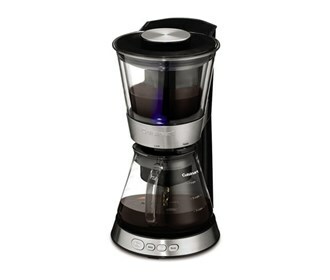 It features unique spin technology that helps circulating coffee through water for total flavor extraction in a fraction of the time manual brewers require. 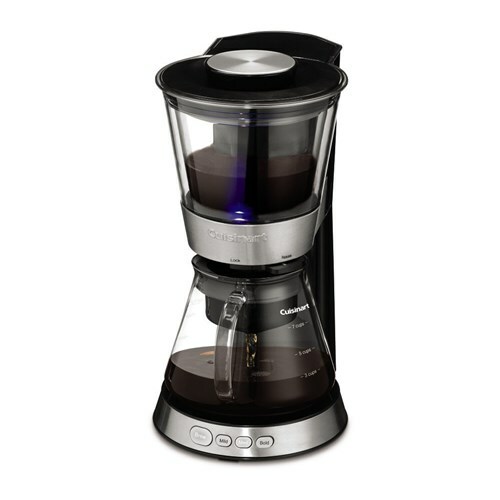 The coffeemaker saturates coffee grounds in cool water, never exposing them to the high temperatures that release oils which can create an acidic taste. The carafe and all removable parts are dishwasher safe for quick and easy cleanup. Three flavor strength options provide a customized coffee experience unique to cold brew, and coffee can be refrigerated in the 7-cup glass carafe for up to two weeks. The Cuisinart 7 Cup Automatic Cold Brew Coffeemaker has many exciting features for users of all types. You can extend the lifetime of your Cuisinart 7 Cup Automatic Cold Brew Coffeemaker with the purchase of a FactoryOutletStore Factory Protection Plan. See the Cuisinart 7 Cup Automatic Cold Brew Coffeemaker gallery images above for more product views. The Cuisinart 7 Cup Automatic Cold Brew Coffeemaker is sold as a Brand New Unopened Item.